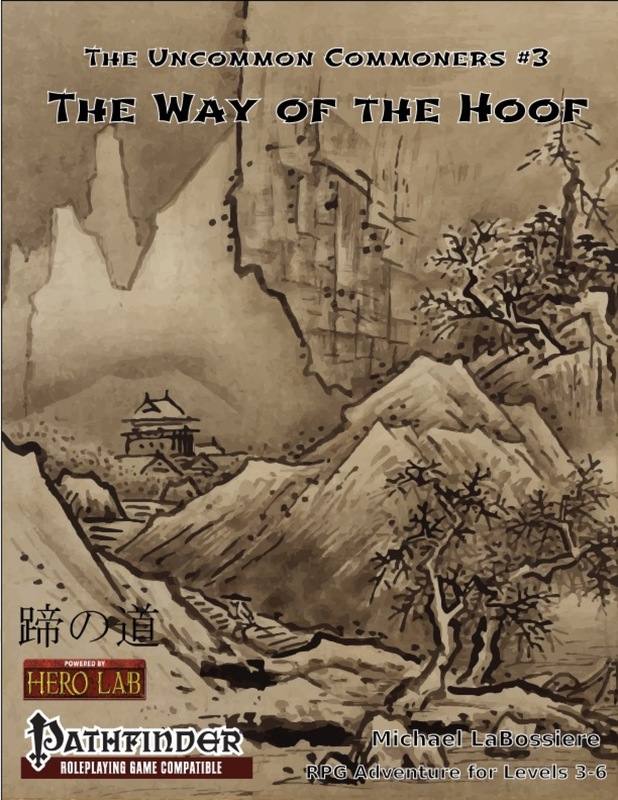 "The Way of the Hoof" is the third book (of seven) in The Uncommon Commoners campaign series. In this semi-epic campaign, the uncommon commoners will fulfill their destiny. Or die trying. Or both—if their destiny is to die trying. Centuries ago a faraway land was ravaged by endless war. Heeding the cries of the people, the Panda Guardians opened a spirit gate allowing refugees to flee to a new land. Once there, the people and animals of Panda Land (as it was named) lived in harmony under the benevolent guardianship of the Panda Monks. But, as always happens, evil entered the area and corrupted the heart of the greatest of the Panda Monks, Jaq-Blaq. He betrayed his fellows and installed himself as a warlord. Despite his might, Jaq-Blaq ruled in fear: the owls prophesized that a donkey hero would free Panda Land. After Jaq-Blaq’s natural (non-donkey related) death, rule passed to his son. The son’s love of food and dislike of exercise earned him the name Fat Panda. While Jaq-Blaq ran the land with stern efficiency, Fat Panda’s sloth, greed and gluttony plunged the land into disarray. While the common folk made a few efforts to rebel against Fat Panda, his minions always managed to crush them. Thus did Fat Panda grow fat with confidence, despite the prophecy that donkey hoofs of justice would kick Fat Panda off his throne. Now the donkey of the prophecy journeys to Panda Land to save the people and to learn of his tragic past! New Feat (Create Spell Stone). New Non Feats (Basket Hat, Cool Name, Dramatic Flair, Dying Monologue, and Fountains of Blood). New Magic Items (Chow Line Hat, Donkey Shows of Throwing, Guide Stone, Gloves of Arrow Stabbing, Jade Earring, and Spell Stones). New Spells (Ice Breaker, Wood Chopper, Stone Breaker, and Iron Breaker). 57 pages of adventure (includes maps)!